Ventana Wildlife Society: Condor Blog: Condor Nestlings Growing Up Fast! Condor Nestlings Growing Up Fast! This spring in Big Sur we have two active condor nests on the coast and two inland. 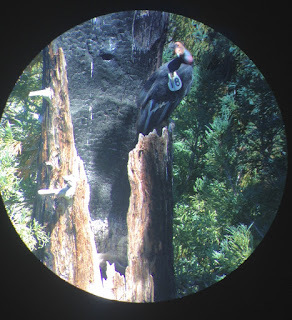 Both coastal chicks hatched at the end of April, and both are in the tops of ancient, burned redwood trees. The first to hatch on the coast was chick number 842. This chick was born to a trio of birds – Female 534, managed by Pinnacles National Park, and males 204 “Amigo”, and 470 “Fuego”. Only time - and a blood test - will tell which bird is the father. All three birds share incubating and chick rearing duties – with three parents we hope this chick will thrive! 842’s redwood home is nestled in a grove high above the Big Sur coast, and the inside of the nest is not visible. However, based on the attentive behavior of the parents, we suspect that this chick is doing well. Our other 2016 nestling is number 838, born to parents 351 and 418, both birds released by Pinnacles National Park that have relocated and lived in Big Sur for years. This nest, luckily, is one we can peak into using a scope. It’s a steep, brushy hike, but from the right vantage point we can see little 838 flapping his wings, playing with sticks, and begging for food from his parents. The two inland nestlings, 828 and 835, are also progressing well. Both hatched in caves in early April in Pinnacles National Park (828) and the other in the Ventana Wilderness (835). The parents of both nestlings are considered 'veterans' and have nested before. Nestling 828's parents are male 340 and female 236 "Tiny" and 835's parents are male 219 "Puff Daddy" and female 310. We anticipate these four nestlings to start fledging as early as October 2016, so stay tuned for more updates! Until then, tune in to the Condor Cam and try to spot wild condors at our release site.